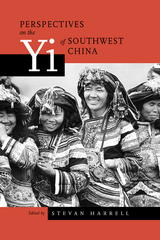 In addition to being valuable as an ethnographic study, this book is also an experiment in communication among three discourses: the cosmopolitan disciplines of history and the social sciences, the Chinese discourse of ethnology and ethnohistory, and the Yi folk discourse of genealogy and ritual. This book uses the case of the Yi to conduct an international conversation across formerly isolated disciplines. Stevan Harrell is Professor of Anthropology at the University of Washington and Acting Curator of Asian Ethnology at the Burke Museum. He is author of the forthcoming Ways of Being Ethnic in Southwest China (2000), Human Families (1997) and Ploughshare Village: Culture and Context in Taiwan (1982). He is also co-editor of Mountain Patterns: The Survival of Nuosu Culture in China (2000), with Bamo Qubumo and Ma Erzi. His edited volumes include Chinese Historical Microdemography (California, 1995) and Chinese Families in the Post-Mao Era (California, 1993, coedited with Deborah Davis).